Echidnas, Volume 38 presents the scientific classification of the mammal echidnas. This book describes the characteristics, behavior, reproduction, embryology, anatomy, and physiology of the spiny anteaters, Tachyglossidae. Organized into 11 chapters, this volume begins with an overview of the natural history, classification, and physical characteristics of echidnas. This text then examines the food intake and digestion mechanisms of echidnas whereby the ground-up insects in the buccal cavity are permeated with saliva secreted by the sublingual, subaxillary, and parotid salivary glands. 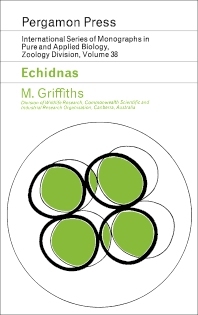 Other chapters describe various stages in the development of echidna embryos and pouch young. This book discusses as well the primary division of the central nervous system of echidnas, including the prosencephalon, mesencephalon, and rhombencephalon. The final chapter deals with the similar anatomical characteristics that anteaters exhibit, and describes also their differences in the grinding techniques, forelimb anatomy, and stomach structures. This book is a valuable resource for biologists and zoologists.